I doubt we should spend much time on the present cost figures as over the lifetime of any new facility both the costs and tax incentive/ disincentives will certainly change. Let world oil production drop post peak to less then say 85 million barrels a day and everything that has been written,said, legislated and , done will be totally redone. I don't know what year that will happen but I'm almost certain it will happen and pretty sure it will be before newly installed wind and solar today wear out. Don't mess with Texas (gas)! Georgetown Utility Systems (GUS) contracted to buy wind and solar at fixed prices until 2035 and 2043, respectively. Georgetown is obligated to buy about twice as much power as it actually needs from green power plants. The city is first in Texas and second-largest in the U.S. to go 100 percent renewable. The idea was that Georgetown would have enough green power to grow into at fixed prices, avoiding market volatility and what they saw as the rising costs of fossil fuels. In the meantime, Georgetown would sell any excess power back to Texas’ electricity market. Likewise, Texas city gate NG prices have increased significantly from 2016 thru 2018: $3.20/mcf in May 2016 to almost $5/mcf in Sept 2018. But to understand the true dynamics of the situation one would have to know the anticipated primary supplier of electricity to Georgetown to get a true picture of what the city would be paying today. In reality, thanks to our absolute controller of the electricity markets in Texas, ERCOT, with our alt energy situation (mostly wind power) there are short periods when electricity generators actually have TO PAY residential users for taking their output. But one has to go back and look at the original pricing expectations of the deal Georgetown made with its alt energy supplier: in the early days the Georgetown residents would be paying above market prices. This was necessary for the wind and solar generators to obtain financing for that expansion. For many years the alts have often not been able to compete with the prices of our fossil fuel sourced electricity. The real economic value for Georgetown would be realized during peak supply shortages and projected very high electricity prices in the future. This is a problem many (if not most) alt energy projects to reduce current fossil fuel consumption have faced: they have minimum, if not negative, CURRENT economic advantage. Which is exactly why you see so few alt energy projects built outside of Texas and just a other states: very few want to build in advance of the need. Of course, if NG prices increase to 3X to 4X current levels that decision will be criticized by some just as Georgetown’s decision is being criticized by some today. Everyone is free to argue about future electricity cost… I’ll pass. But I have no doubt the citizens of Georgetown will eventually be very happy with the premium they are paying today compared to the low prices and guaranteed supplies they’ll experience years into the future. But, what do I know: I’ve only been a petroleum geologist for more then 4 decades. LOL. One is tempted to think something funny is going on. Don’t know, I thought it was a dog! Hmmm, did they forget the third blade? Maybe municipalities should think about protecting the taxpayer and stay out of the wind power generation business! Four years after spending $5 million to install wind turbines at four highway exits, the New York State Thruway Authority is now suing the company, contractor and consultants who installed them because the machines haven't worked since last year. The problem with the above report is that something less than 10% of the humans believe in and accept the goals of avoiding CC, avoiding FF exhaustion, and transitioning to Green energies. Most humans are completely obsessed with consuming more energy, ever-increasing amounts of energy, in order to improve their lifestyles and comfort. Few other than the favored First World nations and citizens even give a moment's attention to CC, peak FF's, or alternative energies. TEOTWAWKI approaches, ever more quickly. Global energy demand grew by 2.3% in 2018, nearly twice the average rate of growth since 2010. Renewables met only 25% (.6%) of this new demand. In other words, the demand for energy was 75% greater than the new installed capacity of all renewables world-wide. In 2004, when I first started following this, modern renewables like wind, solar, and geothermal garnered but .5% of the total energy pie. In 2018, REN21 reports they garner just 1.7%, and are currently growing their “share of the global energy pie” at just .1% per annum, despite wind growing its installed capacity 9.8%, down from 10.8% in 2017, and solar PV growing its capacity 29%, down from 49% in 2016. The demand for energy nearly outstrips all market share gains from the leading renewable technologies. Besides, the International Energy Agency (IEA) projects that bioenergy will be the largest source of growth in renewable energy over the period 2018 to 2023, not wind and solar PV. If we continue to grow at 3% per year, by 2043, the global economy will be two times larger than it is now. It is difficult to imagine creating a renewable energy infrastructure for our existing economy in a short time frame of 24 years, much less doing so for an economy that is two times bigger with 1.6 billion more people to feed, clothe and house by 2050, while at the same time raising the standard of living of another 6 billion, in order to lower their fertility rate to slow population growth. According to the IEA, the investments needed for a Sustainable Development Scenario are only 13% more than investments needed for a more conventional scenario. The world is currently not on track to meet the main energy-related components of the Sustainable Development Goals (SDGs), agreed by 193 countries in 2015. The IEA’s Sustainable Development Scenario (SDS) outlines a major transformation of the global energy system, showing how the world can change course to deliver on the three main energy-related SDGs simultaneously. A strong drive towards electrification (on-grid and off-grid) and provision of clean cooking facilities means the number of people without access to modern energy drops to zero by 2030, transforming the lives of hundreds of millions, and reducing the severe health impacts of indoor air pollution, overwhelmingly caused by smoke from cooking. Energy production and use is the largest source of global greenhouse-gas (GHG) emissions, meaning that the energy sector is crucial for achieving the objectives of the Paris Agreement on climate change. Under the SDS, energy-related GHG emissions peak around 2020 and then decline rapidly. By 2040, they are at around half of today’s level and on course toward net-zero emissions by 2070, in line with the goals of the Paris Agreement. There is no trade-off between achieving climate objectives and delivering on energy access and air pollution goals. Good policy design can exploit synergies between the three parallel objectives of the SDS. Achieving universal access to modern energy only leads to a small increase in CO2 emissions (0.1%), the climate effect of which is more than offset by lower methane emissions due to a reduction in use of traditional biomass cookstoves. The SDS presents an energy transition where renewables and energy efficiency lead the charge in reducing CO2 emissions as well as reducing pollutants that cause poor air quality. Renewables become the dominant force in power generation, providing over 65% of global electricity generation by 2040. Wind and solar PV, in particular, soon become the cheapest sources of electricity in many countries and provide nearly 40% of all electricity in 2040. Emissions reduction in transport, industry and buildings are achieved largely through greatly enhanced energy efficiency and increasing levels of electrification of end-uses. Overall, achieving the vision of the SDS would require an increase of only around 13% in energy investment globally, relative to NPS. kublikhan wrote: Renewables become the dominant force in power generation, providing over 65% of global electricity generation by 2040. Wind and solar PV, in particular, soon become the cheapest sources of electricity in many countries and provide nearly 40% of all electricity in 2040. Yet, in 2018, renewables provided just 26.5% of electricity with only 5.6% from wind and 1.9% from solar PV. (REN21) Their projection requires unheard of growth rates from industries already experiencing a slowing of growth due to the Law of Diminishing Returns and the end of many subsidies. 7.5% to 40% in 22 years in the face of record demand for new energy? With the growth in demand for coal (1%), NG (4.6%) and oil (1.3%) in 2018, I won't be surprised if renewables share of the energy pie declines in the REN21 2019 Global Status Report due out later this year. In 2018, NG use rose so much in the U. S. that renewables share did decline. Last edited by MonteQuest on Fri 12 Apr 2019, 16:11:08, edited 2 times in total. Not 12 years. 22 years. 2040 - 2018 = 22 years. Renewables increased by 4% in 2018, accounting for almost one-quarter of global energy demand growth. The power sector led the gains, with renewables-based electricity generation increasing at its fastest pace this decade. The power sector led the growth, with renewables-based electricity generation increasing by 7%, almost 450 TWh, equivalent to Brazil’s entire electricity demand. This was faster than the 6% average annual growth since 2010.
kublikhan wrote: 07 Apr 2017 - Global renewable capacity has just exceeded coal's capacity: 2006 GW of renewable capacity vs 1965 GW of coal capacity. However coal still significantly outpaces renewables in actual generation: 40% of global generation for coal vs 23% for renewables(renewables generate electricity for a smaller fraction of the day compared to coal). Natural gas consumption grew by an estimated 4.6% in 2018, its largest increase since 2010 when gas demand bounced back from the global financial crisis. The United States was the single largest driver of higher demand, with a gain of 80 bcm, up 10.5% from the previous year. Such historic demand growth was mainly driven by power generation and buildings. A colder winter and hotter summer than average was responsible for around half of the extra gas demand in both sectors. Exactly my point. Despite these massive growth rates, renewables met only 25% of new demand and replaced no fossil fuels. Btw, renewables share of the energy pie grew faster from 2016 to 2017 at .2% per annum. 1.4% to 1.6%. (REN21) In 2018, modern renewables like, wind, solar and geothermal only grew their share of the energy pie .1%. All modern renewables only .2%. 50% of that was unsustainable bioenergy. It doesn't matter how fast renewables grow their installed capacity, as long as new demand for energy, especially coal, NG and oil, exceeds what they supply. Here's the IEA's latest rosy forecast: "By 2040, fossil fuels (oil, gas and coal) will supply about 74% of primary energy, down from about 85% today. All types of renewables and nuclear power will supply about 26% of primary energy. The ‘other renewables’ category, which includes wind and solar, is predicted to supply 6.9% of global primary energy in 2040." --IEA World Energy Outlook 2018. Last edited by MonteQuest on Fri 12 Apr 2019, 16:18:22, edited 1 time in total. Look at the trends. Renewables costs are continuing to decline and policy support for them continues to increase. The exact numbers differ, but projections from all sources show renewables taking a much larger share of the power pie going forward. McKinsey projects that renewables will account for more than 50 percent of global power generation by 2035. In McKinsey’s forecast, renewables are set to grow to 75 percent of generation by 2050. Bloomberg New Energy Finance (BNEF) has published its ‘New Energy Outlook 2018,’ which focuses on technologies that drive change in energy markets. The report projects that 50% of global electricity production will come from wind and solar energy by 2050, with fossil fuels declining to 29%. These increases, the report notes, derive in large part from three key dynamics and technological advances: 1) photovoltaic (PV) module prices continuing to drop, keeping pace with learning rates and capacity increases; 2) the continued development of larger and more efficient wind turbines; and 3) decreasing costs for battery packs, in part due to rising electric vehicle sales, that have applications for stationary energy storage. Noting their economies of scale, BNEF projects a 66% drop in battery packs’ cost by 2030. Across these sections and regions, the report expects the vast majority of finance for new power generating capacity to go towards renewables. Between 2018 and 2050, BNEF projects US$8.4 trillion to be invested in wind and solar energy, out of a total US$11.5 trillion. kublikhan wrote: Look at the trends. The "trend" is that renewables are growing their share of the energy pie .1% per annum. This has been the case for the last 14 years. .5 in 2004 to 1.7% in 2018, and it's not increasing. The "trend" is that energy demand is growing faster than renewables can be brought on-line, despite lower costs, despite more support, despite massive growth rates. LOL! I'm starting to sound like a broken record. I had this same debate 14 years ago. I won that one. So, what''s your prediction for the REN21 2019 Global Status Report? Wind, solar, and geothermal will rise from 1.7% of the pie to what? Also, keep in mind the IEA has a track record of vastly underestimating how fast renewables will grow. If we are to go by past track records, Bloomberg's forecasts on renewables growth have been closer to reality than the IEA's. And Bloomberg is predicting 75% of the power pie to come from renewables by 2050. Scenarios from the International Energy Agency (IEA) have failed to predict the growth of renewables and overestimated the role of nuclear. Last year, the world's photovoltaic power capacity overtook nuclear for the first time – reaching 402 gigawatts, compared to 353 (GW). Wind power outstripped nuclear back in 2014, and by the end of 2017 amounted to 539 GW. Back in 2010, you might not have predicted such a shift in the global energy mix – at least, not if you were basing your predictions on the International Energy Agency's annual Word Energy Outlook (WEO), which estimated annual deployment of less than 10 GW of photovoltaic capacity. According to this scenario, globally installed solar capacity would hit around 85 GW last year – 315 GW less than the actual figure. Critics say this is part of a pattern of the IEA consistently underestimating the growth of renewables. And that imbalance has, according to a 2015 study, has continued in subsequent annual WEOs from the IEA, which ignores facts such as "climate protection and divestment of finance from the conventional energy sector." Claudia Kemfert, head of the German Institute for Economic Research's energy and environment department, told DW the IEA has underestimated drop in renewable power costs, as well as the cost of nuclear and fossil alternatives. Hans-Josef Fell, president of the Energy Watch Group, says the IEA acts "on behalf of the OECD governments that ultimately oversee it," and reflects their ongoing commitment to the fossil fuels sector. the IEA has always been, and remains, dismally pessimistic about wind and solar energy. This pessimism has led it to underestimate wind and solar again and again, a track record of failure one might think would trouble an agency known for the quality of its modeling. That the IEA has historically underestimated wind and solar is beyond dispute. * WEO 2010 projected 180 GW of installed solar PV capacity by 2024; that target was met in January 2015. * Current installed PV capacity exceeds WEO 2010 projections for 2015 by threefold. * Installed wind capacity in 2010 exceeded WEO 2002 and 2004 projections by 260 and 104 percent respectively. * WEO 2002 projections for wind energy in 2030 were exceeded in 2010. * Other, independent analysts (like those at Bloomberg New Energy Finance and Citi) have come closer to accurately forecasting renewables. The only forecasts that match IEA's inaccurate pessimism are those from the likes of BP, Shell, and Exxon Mobil. The International Energy Agency consistently underestimates wind and solar power. kublikhan wrote: Also, keep in mind the IEA has a track record of vastly underestimating how fast renewables will grow. There have been rosy and underestimated projections for decades. The history shows they have all been wrong with regard to how soon renewables would overtake and displace fossil fuels. Solar technologies have improved greatly and will continue to become cheaper and more efficient. But the era of 10-fold gains is over. The physics boundary for silicon photovoltaic (PV) cells, the Shockley-Queisser Limit, is a maximum conversion of 34% of photons into electrons; the best commercial PV technology today exceeds 26%. Wind power technology has also improved greatly, but here, too, no 10-fold gains are left. The physics boundary for a wind turbine, the Betz Limit, is a maximum capture of 60% of kinetic energy in moving air; commercial turbines today exceed 40%. Let's stick to the math, screw the forecasts. In 2018, renewables met .6% of new demand. Therefore, in 2019, to just meet new energy demand (if that demands remains at 2.3%) they would have to grow 300%. Their grow rate has been declining, as I noted above. The weighted LCOE for utility-scale solar fell from more than $350/MWh in 2009 to less than $50/MWh in 2017. The weighted LCOE for wind energy declined from around $135/MWh in 2009 to less than $45/MWh in 2017. 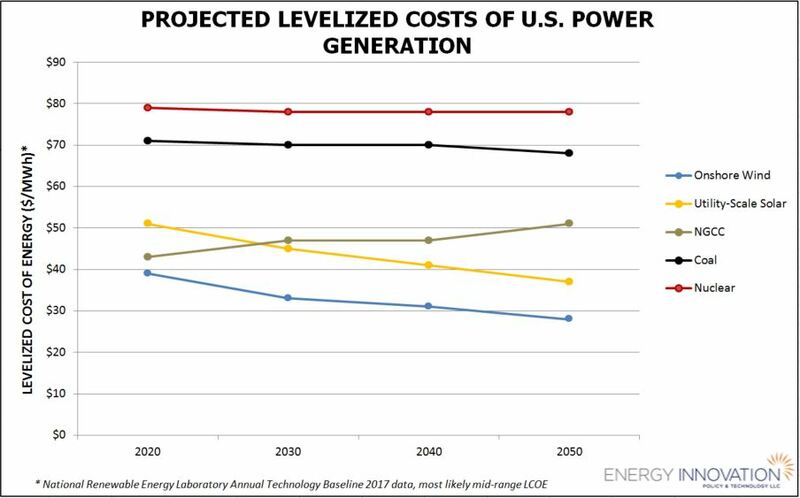 The National Renewable Energy Laboratory’s (NREL) Annual Technology Baseline 2017 predicts onshore wind and utility-scale solar will continue their rapid cost declines. NREL considers recently installed and anticipated near-term projects to forecast onshore wind’s most likely mid-range LCOE will be $39/MWh in 2020, $33/MWh in 2030, $31/MWh in 2040, and $28/MWh in 2050. Similarly, NREL forecasts utility-scale solar’s most likely mid-range LCOE will be $51/MWh in 2020, $45/MWh in 2030, $41/MWh in 2040, and $37/MWh in 2050. By comparison, NREL forecasts the LCOE of fossil fuel generation will hold steady or even increase. The ATB predicts the most likely mid-range LCOE for natural gas combined-cycle plants will be $43/MWh in 2020, $47/MWh in 2030, $47/MWh in 2040, and $51/MWh in 2050. Similarly, NREL forecasts coal’s most likely mid-range LCOE will be $71/MWh in 2020, $70/MWh in 2030, $70/MWh in 2030, $70/MWh in 2040, and $68/MWh in 2050. Finally, NREL forecasts nuclear power’s most likely mid-range LCOE will be $79/MWh in 2020, then remain at $78/MWh starting in 2030 through 2050. Global commissioning of onshore wind turbines declined 3 percent in 2018, partly due to a slowdown in India and Germany. Growth is expected to bounce back in 2019, with a 32 percent jump to 60 GW. Developers commissioned a little over 45 GW of onshore wind turbines globally in 2018 compared with 47 GW a year earlier. Once again in 2018, the 100 GW mark for new PV capacity was narrowly missed. Analysts say 98 GW of PV capacity was installed last year, a gigawatt shy of the figure they registered a year earlier. By the end of 2018, the world had installed cumulative PV capacity of almost 500 GW. PV Market Alliance expects 120 GW of new solar capacity in 2019. The Energy Information Administration (EIA) published its latest forecast for new electric generation in 2019 with fully 66 percent of the expected 23.7 gigawatts (GWs) of new generation coming online, coming from renewable energy sources, while the rest will come from natural gas. At the same time the majority (53 percent) of the 8.3 GWs of electric generation retirements will be coal plants. The majority of the new electric generation will come from wind, which will make up 10.9 GWs of new generation, that’s 46 percent of all new generation. Solar will account for 18 percent of electric generation with 4.3 new gigawatts of utility-scale solar power. However, 3.9 gigawatts of small-scale solar, like rooftop solar, also is projected to come online in the year. Another 34 percent of electric generation, 7.5 GWs, is expected to come from new natural gas plants, the agency added. The remaining 2 percent of new utility-scale electric generation will come from other renewables and battery storage capacity. Coal is becoming increasingly less competitive. The largest energy source being retired in 2019 will be from coal plants. Just one coal plant, the Navajo station in Arizona will account for half of the planned retirement capacity for coal. That plant came online in the 1970s. Still, EIA stated that the 4.5 GWs of coal power retiring in 2019 is much less than the 13.7 GWs of coal that retired in 2018.
kublikhan wrote: Theoretical increases in conversion efficiency are not the deciding factor we are talking about. No, it is not. What we are talking about is how much of the primary energy pie has renewables captured? Every year since 2004, people have posted on many forums that renewables are soon to overtake fossil fuels and capture a huge market share of our overall energy pie, yet they never do. In fact, the last time I weighed-in on this back in 2016, I think it was, you posted all manner of growth projections, cost reductions, etc--just like you are doing now. Many of them came true, but they hardly changed a thing. Solar PV, wind and geothermal comprised 1.4% of our energy back in 2016. 1.6% in 2017, and now 1.7% in 2018. They only met 25% of new demand in 2018. You can post all manner of growth projections, cost reductions, etc, but as long as the demand for new energy exceeds the new installed capacity of renewables, it doesn't matter one wit. As long as the hole in the bucket is larger than what you can pour into it, it will never be filled. So, I ask again, what''s your prediction for the REN21 Renewables 2019 Global Status Report? 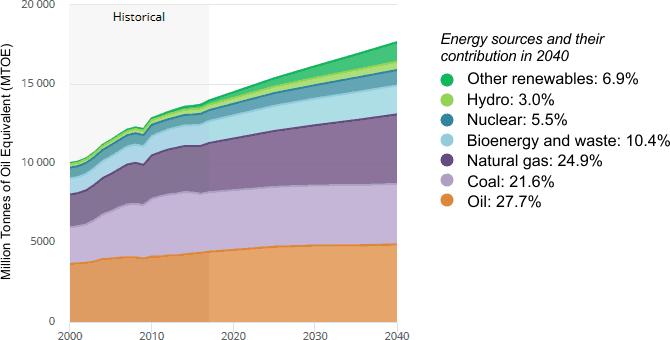 Wind, solar, and geothermal will rise from 1.7% of the energy pie to what percentage? Do you see renewables growing their installed capacity 300% in 2019 to even meet new energy demand? The report comes out later this year.